In an almost unprecedented move, Mayor Bill de Blasio has pledged $3 billion in funds to repair housing projects that were destroyed or damaged in Hurricane Sandy. 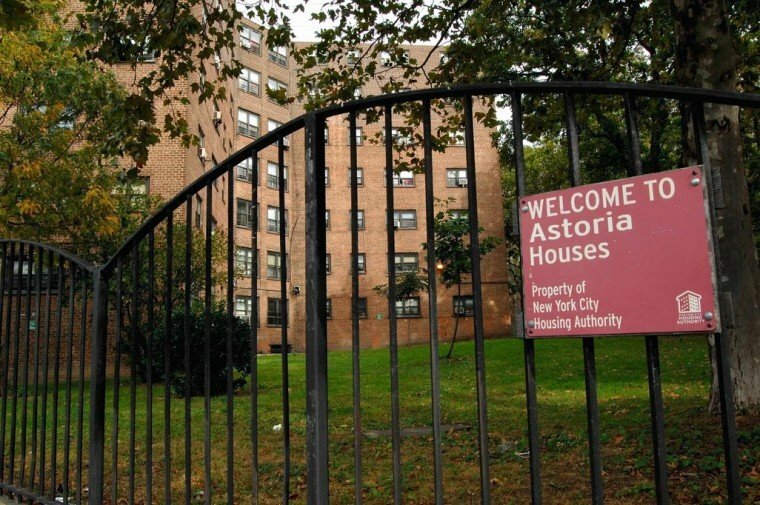 The $3 billion will go to 33 different housing projects – one of which is the Astoria Houses. Essentially half of the money will go towards fixing problems that were caused and repairs that need to be made, and the other half will go towards preventative resiliency measures. Repairs to problems such as flooded basements and boiler rooms will be made, as well as adding generators to buildings, fixing roof tops, play areas, and installing flood barrier systems. NEW YORK—New York City Mayor Bill de Blasio and U.S. Senator Charles Schumer announced today approximately $3 billion in federal funding to repair and protect 33 public housing developments that sustained severe damage during Hurricane Sandy – the largest FEMA grant in the history of the agency. Half of the funds will be designated for repairs, while the other half will be aimed at implementing resiliency measures to better protect developments from future disasters. The funding is authorized by FEMA’s Alternative Procedures, which provides a lump sum payment instead of the typical incremental funding by FEMA. Approximately $3 billion in funding will allow the New York City Housing Authority (NYCHA) to repair and enhance resiliency at 33 developments where Sandy’s storm surge flooded basements and first floors of NYCHA buildings, severely damaging boilers and electrical and mechanical equipment, and leaving many residents without power and heat for days or weeks. Today’s funds mean that NYCHA will be able to make critical repairs and implement key resiliency measures to better protect residents. NYCHA will be able to address considerable damage caused by Sandy at various developments where electrical and mechanical systems were crippled and in many cases completely destroyed. The funds will also allow NYCHA to take steps to make these developments more resilient to future storms. 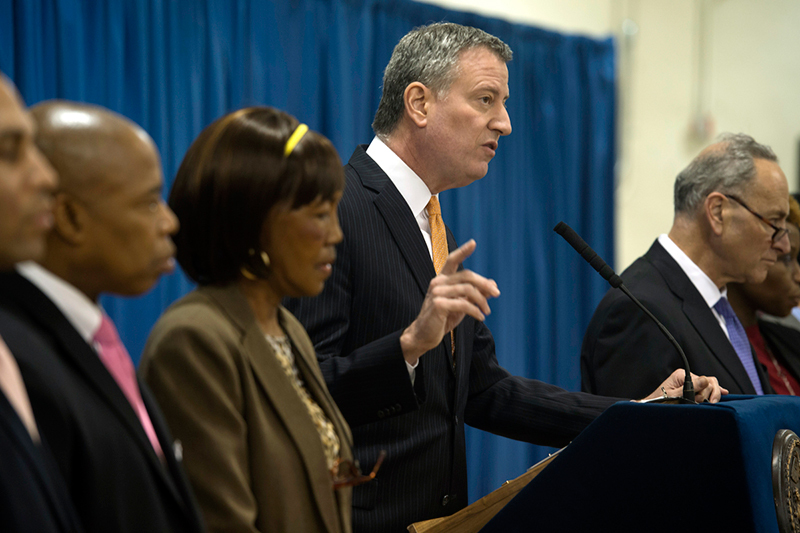 New construction of elevated boilers, installation of flood barrier systems, and stand-by generators will now help protect NYCHA residents from future extreme weather. The work completed via this funding will be subject to NYCHA’s recently negotiated Project Labor Agreement with the Building and Construction Trades Council (BCTC) of Greater New York, as well as its affiliated unions – allowing NYCHA residents to gain access to union jobs and training and helping ensure swifter capital construction. This agreement with FEMA follows other significant progress as a result of Mayor de Blasio’s overhaul of Sandy recovery programs. The new Mayor’s Office of Recovery and Resiliency is also implementing key resiliency measures, including an integrated flood protection system in Red Hook in collaboration with the State, and many other short-, medium-, and long-term measures across the five boroughs. The lump-sum award will jumpstart much-needed repairs across NYCHA properties and follows many billions in federal funds Senator Schumer has already secured on behalf of Sandy-impacted areas across New York City. NYCHA requires more than $18 billion beyond the funding announced today to address its broader unmet capital needs across its portfolio of more than 330 developments. Eroding annual support for NYCHA has resulted in more than $1 billion in lost funding in recent years, hindering the Authority’s ability to keep its buildings in a state of decent repair and maintain a basic quality of life for the more than 400,000 New Yorkers living in NYCHA. • New electrical buildings, to be built above FEMA FIRM to reduce flood risk, that will house buildings’ main electrical components. “This historic announcement ensures that NYCHA remains a restoration and resiliency priority as we continue to recover from Superstorm Sandy. For far too long, families, seniors, and the most vulnerable have endured declining living conditions as a result of Sandy. This timely investment will improve these conditions for tens of thousands of New York City residents and will go a long way to protect us against future storms,” said Congressman Gregory Meeks. “Today’s historic commitment to help rebuild New York’s communities damaged after Sandy is a welcome step in the right direction. Red Hook residents are tired of red tape and bureaucracy; they need their development fully restored. I want to thank Senator Charles Schumer and Mayor Bill de Blasio for their leadership in obtaining this tremendous FEMA grant. These funds will help a community rebuild, prepare for future sustainability and resiliency, and continue to establish Red Hook as one the city’s premier neighborhoods,” said Assembly Member Felix Ortiz. “This is tremendous news for the countless residents who have endured so much since Sandy devastated their homes, and a victory for all of the public housing residents who are still struggling to finally recover. It is the direct result of the residents who mobilized following the storm, and brought to light these inhumane and deplorable conditions at a hearing that my committee held in Coney Island with the support of Speaker Melissa Mark-Viverito and Council Member Richie Torres. Now that we have this funding in place thanks to the devotion of our elected officials including Mayor de Blasio and Senator Schumer, it is imperative that it leads to action on the ground in impacted communities across the city,” said Council Member Mark Treyger, Chair of the Committee on Resiliency and Recovery. “This vital funding provided by FEMA will not only repair the 33 of the NYCHA developments greatly affected by Sandy but it will protect and secure these developments from future storms and disasters. I commend Senator Charles Schumer and Mayor Bill de Blasio for their leadership and advocacy in securing these funds and making this great city safer and more resilient. Thank you FEMA for funding this project and fortifying our developments,” said Council Member Inez Dickens. “This $3 billion federal grant will help repair the NYCHA developments most hard-hit during Sandy, and, equally importantly, fortify them for future storms. During the storm, Stanley Isaacs in my district flooded, leaving many residents in despair. These funds will help secure Stanley Isaacs, and other NYCHA developments, so residents do not have to go through that struggle again,” said Council Member Ben Kallos. “This funding is much-needed for NYCHA developments impacted by Hurricane Sandy like Gowanus Houses. Thank you to Mayor de Blasio and Senator Schumer and I look forward to seeing this funding help our NYCHA communities throughout the city,” saidCouncil Member Stephen Levin. “The unprecedented nature of this funding to NYCHA – I hope – is symbolic of different, and better, times ahead in terms of support to public housing in New York City. The breakdown of the funding – to address both damages caused directly by Hurricane Sandy and to create resilient infrastructure – is critically important because it means preparing vulnerable NYCHA residents for the realities of a changing and unpredictable climate. In the Red Hook Houses – the second largest NYCHA development in the City – residents were adversely affected by storm weather, and continue to struggle to regain normalcy in their access to heat, hot water, and damaged open space amenities. I am encouraged that this funding will begin a conversation about the needs that remain, and the commitments required to making NYCHA whole,” said Council Member Carlos Menchaca. “These funds are welcome and needed relief for residents impacted by Hurricane Sandy and also will help create good union construction jobs and provide opportunities to NYCHA residents thanks to a recently signed project labor agreement between NYCHA and the BCTC. We are thankful to Senator Schumer and Mayor de Blasio for their leadership in making this come to fruition,” said Gary LaBarbera, President of the Building and Construction Trades Council of Greater New York (BCTC). “We applaud the allocation of $3 billion in federal funding for NYCHA will provide much needed repairs and resiliency measures. Elevating boilers, including back up generators, and replacing damaged doors and windows are key to protect our public housing residents during future storms. Additionally, this work will create new jobs, many of which will go to NYCHA residents,” said Matt Ryan, Executive Director of ALIGN. “Faith in New York and our congregations applaud Mayor de Blasio and Senator Schumer for their work in bringing billions of dollars of new investment for NYCHA residents that desperately need and deserve these repairs. In areas like the Rockaways, NYCHA residents have been suffering from mold and disrepair that was only made worse by the storm. With this announcement and the newly announced Build it Back contracts, the Mayor has continued his commitment to assuring that Sandy recovery investment truly benefits those that are most in need,” said Onleilove Alston, Executive Director of Faith in New York. “We support FEMA funding NYCHA for repairs and resiliency in public housing hit by Superstorm Sandy. Elevating the boilers, putting in backup generators, and repairing roofs were identified as priorities in our Weathering the Storm report. These critical improvements will ensure residents do not have to live without heat, electricity, or hot water after future storms as we did after Sandy. NYCHA has long been underfunded and we hope this funding signals a true commitment to fully fund the repairs and resiliency needs of all NYCHA developments,” said Vernell Robbinson, Community Voices Heard member and resident of Carlton Manor in Far Rockaway.